If you’ve not seen Kasabian live for several years, prepare yourself for a show with a lot more flash, loads more swagger, thousands more people in attendance—and feathers. (See guitarist/vocalist Sergio Pizzorno’s feather-trimmed parka. And his feather necklace when he removes his parka—and the feather decal on the bass drum.) The feathers are, of course, a theme tying the highly ambitious stage show to the band’s 2011 release Velociraptor!, which received favorable criticism from the music press and was proclaimed to be among Kasabian’s best work to date. The shaggy, understated upstarts whose raw but ridiculously tight set made the headlining Oasis seem a trifle anticlimactic when the two bands toured together in 2005 now boast a stage concept and complementary costuming. They can command concertgoers filling a massive arena to wave their arms or sit down, and everyone listens. Lead singer Tom Meighan can wear dark black sunglasses, as if James Dean Bradfield of the Manic Street Preachers—or Bono, if you will—and no one seems to mind, because they’ve earned this. The first two minutes or so of the O2 Arena show in London, which took place December 15, 2011, is certainly an opening sequence that foreshadows the spectacle to come. A huge light arch throbs onstage as the “Switchblade Smiles” artwork spins on a screen in the background. The rhythmic buildup is reminiscent of the days when Oasis would start their show with “F•••in’ in the Bushes,” and only climaxes when Meighan’s digitally manipulated likeness appears onscreen and begins singing the first track, “Days Are Forgotten,” the biggest chart-topper off Velociraptor! The level of energy, both from the band and the crowd, remains consistent throughout the remaining 18 tracks. Segues from song to song are seamless, reminding everyone that this band hasn’t garnered “Best Live Band” and “Best British Band” accolades for no reason. Highlights include West Ryder Pauper Lunatic Asylum’s multilayered “Where Did All the Love Go?” with its melodic backing vocals and groovy, proggy middle bit; the inclusion of British string quartet Dirty Pretty Strings; “Thick as Thieves,” which ends in “People are Strange”; classics like “I.D.,” “Club Foot” and “L.S.F.”; and perhaps the grandest “Happy Birthday” Sergio Pizzorno has ever had sung to him. “I Hear Voices,” the 30-minute documentary included as a bonus feature here, and on both the standard and special edition versions of the DVD, explains where the band were coming from, as far as the feathers and the extravagant set design go. Clips from several stops on the 2011 UK tour show the band engaging in standard band stuff: partying, being exhausted, being funny, and the rest. Watching them walk the corridor en route to the stage to the theme of Rocky on trumpet is probably the most memorable moment. The one regretful thing is that this is Kasabian’s first stand-alone video release. 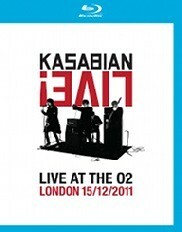 I wish they’d documented Kasabian live at some little club with 200 people for whom they were going off as if they were playing to the O2 Arena. Then, perhaps, the sound quality would’ve retained its authenticity. Perhaps it’s because the O2 in London is so large it can house 18,000 double-decker buses—or maybe it’s just how live concert videos are done these days—but the compression of sound is definitely audible, and the fluctuations in volume are quite noticeable. Although the set list is great, the visuals are there, and the sound is corrected, the couch viewer will probably feel as though he or she isn’t getting the full live effect. It looks exciting inside the television, but because the sound isn’t sufficiently dynamic, you can’t quite get there like a fan would want to.